Health:Further delivered interesting takeaways from Walmart, Dell Medical School, Cerner, athenahealth & MEDITECH. The companies are bullish on data analytics, design-thinking and interoperability. Social Determinants of Health remains a challenge. Last week, I had the chance to attend the 2018 Health:Further event (H:F) for the first time. I say event rather than conference because the latter would not do justice to the non-traditional format of the gathering in Nashville. Instead of the standard plenary+breakouts+exhibit-hall arrangement that is the norm for conferences, H:F used a music-festival approach with multiple stages in a giant exhibit hall. This was a perfect match to the unique venue – Nashville’s Music City Center. The music-inspired multiple-stage approach allowed participants to easily and quickly move between talks. Each stage was curtained off with convenient entrances on each side of the seating area. The lack of walls and doors gave the event a dynamic and fluid feeling – with many members of the audience deciding to move to a different stage after listening to the opening statements of the session they were currently watching. Although it may have been disheartening for speakers to see people getting up to leave, in most cases there was an equal flow of people into the audience as were leaving. #HealthFurther18 is over. As an attendee I loved the format and flexibility to choose sessions in different tracts to attend that fit my interests. All of the speakers and exhibitors were very accessible and accommodating. Great opps for networking. Thank you H:F team! As a veteran conference attendee, I have no hesitation voting with my feet, but many others do not want to make a scene opening the heavy conference room doors. Most just stay put and check email while the speaker completes the presentation. Neither benefits in that situation and so the H:F organizers overcame this challenge by adopting the festival format. 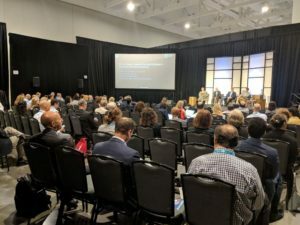 Over the three days of the event, I had the opportunity to listen to thought-leaders from a number of high-profile companies including Walmart, HCA Healthcare, Dell Medical School, Mass Challenge, the Department of Health and Human Services, Cerner, MEDITECH, and athenahealth. From this outstanding lineup of speakers, several key interesting takeaways emerged. Marcus Osborne, Vice President of Health & Wellness Transformation at Walmart, spoke about the retail giant’s use of consumer purchasing to detect changes in people’s health. The company has done research on the buying patterns of its consumers and they have found that small changes in purchase behavior are strongly linked to changes in a person’s health. The data and linkage is so strong that it may be possible for Walmart to know about it before the person even has had a chance to go see their doctor! I’m excited to see how retailers like Walmart, Amazon, Target, and others can impact health with this depth of data analysis. Osborne also spoke about using data analytics to help drive down the cost of healthcare for it’s workforce by guiding people to higher efficacy treatments. Osborne used the term “appropriate care” when describing how data could be used to match employees with the best healthcare professional given that person’s unique health needs. The company estimates this could yield over $1Billion in savings. Stacey Chang, Founder & Executive Director of the Design Institute for Health at UT Austin, challenged the audience to think seriously about the role of design in healthcare. He made the case that design-thinking and well-designed healthcare organizations (physically and from a process perspective) will be the winners as the system becomes more value-based and consumer driven. Chang’s most thought-provoking takeaway was his statement: “To provoke change with technology – allowing humans to interact again”. That is, to truly affect change in healthcare, we need to work on technologies that bring people closer together and allow them to interact with each other, rather than with a computer screen. In one of several all-women panels, the topic of diversity and how different perspectives are needed to improve healthcare was discussed. One panelist spoke passionately about the need for healthcare to be more inclusive of everyone involved in care: patients, care-givers, clinicians, administrators, payors, employers, etc. Another panelist quickly added that diversity of industry and training was also needed – that healthcare would benefit from perspectives from outside the industry and from people with non-medical backgrounds like arts, philosophy and music. Whoa – moderator Robbie Morris just asked panel of MEDHOST, Meditech, Cerner, and Athenahealth if a world on only Epic would solve #interoperability during #SOSE18 at #HealthFurther18. I see you @IronBridgeCorp. The panelists spoke at length about practical strategies to achieve interoperability – strategies that did not involve creating yet another standard, government regulations or financial incentives. The consensus of the panel was the EHR companies simply needed to get down to work and make their respective systems talk to one another because it’s the right thing to do. The final takeaway from H:F was that social determinants of health (SDOH) is slowly entering the consciousness of healthcare. More and more people are starting to realize and see that we cannot address health if we do not also address poverty, education, the lack of jobs, transit and food deserts. Unfortunately SDOH solutions are still in short supply. No one I spoke to had any solid ideas that would scale and everyone acknowledged this would continue to be a challenge over the next decade. 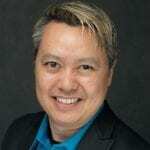 Special thanks to the Tennessee HIMSS organization for inviting me to the 2018 Health:Further event.